If you are traveling through Portugal and you happen to be in Ericeira, one of my favorite spots, make sure you visit this small Health Food Store. When I moved to Portugal, one of the things I was missing the most were Health Food Stores. Santa Cruz, California had them all. I think there are more Health-Food-Nuts on a square footage than anywhere else in the world. Therefor you can buy the bumper sticker “Keep Santa Cruz weird” (Get a T-Shirt if you feel inclined). And the peeps are. In a loving way. Anyway, I’m excited to report that we have options in Portugal too! It did not look like it at first, but after lots of digging they popped up. One choice after another. BE U – this store is small but has everything you need for your vacation and more. They do offer Pilates, Massage and sometimes workshops. BRIO – they have a good number of locations now. In Lisbon as well as outside of Lisbon. Celeiro – this one you can find almost in ANY shopping mall. They do have pretty much everything. The only missing part is fresh vegetables, fruit and bread. But they do have a lot of supplements. Circulo Bio – I’m about to get my first order as they carry Dr. Bronner Castille soap for my Essential Oil Recipes and my toxin free Body and Facial products. They also offer some Aromatherapy Accessories I would like to try out as they are hard to find in Portugal. Quinta do Arneiro – now these guys rock my world and of course my children ones too. If you live in the greater Lisbon area and you have a hard time distinguishing organic vegetables from non-organic on the vast amount of Farmer’s Markets you might want to consider to have those guys deliver your Yummies to you. Their website is in English an they are just GREAT. A bit on the pricey side but you know what you get. You can also visit their farm and they will open up a Restaurant on June 13th, 2016. 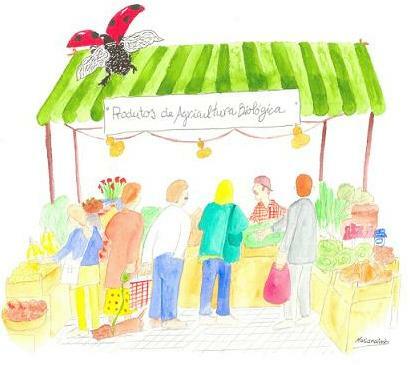 BIO/ ORGANIC Farmer’s Market – For a perfect Saturday, walk over to Príncipe Real Park in Lisboa. I love this area. So much to do and explore. Perfect with and for children as there is a playground in the park and they do have coffee and breakfast there too! From 9am to 3pm, fresh fruits and vegetables, hand-made olive oils, jellies, breads, etc., are for sale at the far end of the tree-lined park. Sit on the benches afterwards and enjoy the lovely neighborhood feeling… and don’t forget to buy a straw bag to carry your goodies home again! Click the link above for further markets. The above one is my favorite.